It’s such a topsy-turvy world right now that if you’re like me, it might take more than a little time spent viewing cat and puppy videos to elevate your mood. So I’m glad to share the story of Embodied Labs. When I think about the future of health and wellness care for elders, one looming issue is how we can attract a broad and well-trained workforce to understand and help us through a gauntlet of serious illnesses or chronic conditions. So it is enormously heartening to learn about a group of young professionals who have dedicated themselves and their business to this work. If compassion and kindness are rooted in the ability to “walk a mile in someone’s shoes,” Embodied Labs – which didn’t exist until 2016 — gives that dictum the ultimate technological boost. In short, it sits at the intersection of health care training and virtual reality storytelling. Washington’s professional background is in curriculum development. Carrie Shaw, CEO and founder, got her Master’s degree in biomedical visualization (which was once called medical illustration) in 2016. But it was their experience as family caregivers that provided the impetus for creating Embodied Labs. Shaw tells the story about how she became a caregiver for her mother, diagnosed with early onset Alzheimer’s, and who also struggled with macular degeneration. She created a tool – a simple pair of eyeglasses with patches in two different places – to give her mother’s aides a sense of what it was like to see the world from her mother’s perspective. What if you could use science, storytelling and virtual reality to convey the experience of an aging person? Would that help health care providers, be they professionals, direct care workers or family members, become more effective and better at communicating, in their caregiving efforts? Embodied Labs uses film combined with interactivity that literally enables a person to walk in the shoes of a person with serious health issues. So far there are three “labs” available to the company’s subscribers: “Alfred,” a 74-year-old African-American man who suffers from macular degeneration and hearing loss; “Beatriz,” a middle-aged Latina woman who has been diagnosed with early Alzheimer’s disease; and “Clay,” a 66-year-old veteran who has been diagnosed with Stage IV lung cancer and faces end-of-life issues and participates in hospice care. Voice interaction is one element in the Beatriz Alzheimer’s lab. At one point, a person “embodying” Beatriz is asked to read a few sentences; but the words come out garbled and make little sense. It conveys what it might feel like to try to communicate but to be unable to express what you mean. For the Clay end-of-life lab, Washington’s research included spending two days in a hospice facility, shadowing members of the hospice team. The lab’s credits list 75 people, including actors, those who worked in production, post production and subject matter experts. Creating a lab is a research and labor-intensive process. Once a topic is decided upon, staff members talk to subject matter experts as well as family members, then decide on learning outcomes they want to achieve. All of that goes into script writing. Then the film is produced. At first, the company’s subscribers were mostly in academia. But now it has long term care and home health care companies on board. They’re also in talks with nonprofit organizations and with individuals who do corporate training; public libraries and Alzheimer’s groups represent other potential subscribers. Looking ahead, Washington believes that in 2019 virtual reality will be more available and affordable for consumers, which could be a boon for family caregivers. And while Embodied Labs is focused on aging issues now, the company is looking at experiences of other vulnerable populations too. “We try to explore difficult subjects, not skills-based training,” Washington said. So far, the company’s labs have focused on what happens to a person in his or her home setting. The next lab will focus on the transition from living at home to a skilled nursing facility. It will likely include such elements as difficult conversations, the family dynamic, how long-term care can meet a need, what’s different about an institutional setting. And I’d say, we should all be glad that they did. Because June is LGBT Pride Month, I wanted to talk about an issue that rarely gets the attention it deserves. It certainly has not been raised in the midst of the discussion following the Supreme Court’s decision over a baker’s right not to bake a wedding cake for two men. The fact is, when advanced illness strikes, elders who are gay, lesbian, bisexual, transgender or gender non-conforming face more challenges than their heterosexual peers. They are likely to have more complex health conditions than their heterosexual peers, made worse by postponing or not seeking care. Social isolation is a major issue as LGBT seniors are three to four times less likely to have children, twice as likely to live alone and twice as likely to be single. And they may be in poorer financial straits. Going back into the closet out of fear of neglect, disapproval or abuse, is not uncommon. Their fears are not unfounded. In Spring 2011, six organizations who advocate for elders and for the LGBT population published a study: “LGBT Older Adults in Long-Term Care Facilities: Stories from the Field.” Among the highlights: Only 22 percent said they could feel open about their sexual orientation with staff at a nursing home, assisted living or other long-term care facility. Of those who lived in long-term facilities, or cared for those who did, the most frequently reported problem was negative treatment from other residents, followed by verbal or physical harassment by staff. Moreover, 51 percent reported staff refusing to provide basic care (such as toileting, bathing or feeding. Some respondents shared a litany of sorrows and stories of lives derailed, couples separated by family members who had legal authority over the facility resident; feelings of loneliness and isolation because of disapproval by other residents or staff; having aides attempting to get people to “repent” for their sins; choosing to go back into the closet for fear of neglect or harm. For those living with HIV, there are associated issues to worry about, including cardiovascular disease; cancer (non-AIDS); liver, kidney and neurological diseases; osteoporosis; and frailty. Up to 30 percent of people living with HIV have abnormal kidney function, which, untreated, can be fatal. And if contending with serious illness is a challenge for gay and lesbian people and those living with HIV, it presents even more hurdles for transgender individuals. Owing to a combination of mistrust in the health care system and experience of rejection, discrimination or simple lack of medical knowledge by health care professionals, transgender individuals are at a higher risk for long-term diseases. But in the midst of this sorry state of affairs, many people and organizations are working to make LGBT elders’ lives better: to make them feel more welcome in senior housing and long term care settings; to train direct health care workers to treat them more equitably; and to address their needs with expertise, kindness and compassion. One example is Garden State Equality (GSE), a large LGBT organization in New Jersey, where Bianca Mayes, Health and Wellness Coordinator, heads the organization’s Pledge & Protect program. The program is designed to educate all health care providers, including nurse practitioners, doctors, therapists, dentists and other direct service providers, as well as staff in long-term care developments. It also urges service providers, organizations and long-term care facility owners to pledge their commitment to advancing equitable treatment. Three levels of training are offered, and training covers four general elements: an exploration of gender identity terminology; an overview of historic and current discriminatory practices; general health care disparities and needs (lack of insurance, transportation, poverty, homelessness, lack of legal protection, lack of cultural competence); and recommendations, including ways to design intake forms to be inclusive. Mayes started implementing the program in November 2017. It has reached more than 125 health care professionals. GSE has also sent out information to seven sites in two counties in New Jersey. This coming weekend, Garden State Equality and the Green Hill senior living development, will hold a one-day LGBT Senior Housing and Care Expo that will include speakers, panels, vendors and a networking lunch. It will be free to the public. This summer GSE plans to host 10 focus groups serving all 21 counties to help produce a statewide needs assessment. GSE estimates that there are some 100,000 LGBT men and women over 55 living in New Jersey. Mayes’ biggest hope is that more health care providers will reaching out to the LGBT community. “They’re not necessarily going to come to you and their needs are dire,” she said. An Early Valentine’s Day Gift! A Free Book! Enter before Feb. 14 and you could be among the 20 winners of this award-winning book about educating ourselves and our loved ones about the best possible care in our later years, to avoid medical crises down the road. It’s a book with a lot of heart and a lot of practical guidance, too! The giveaway will only last from Feb. 1 to Feb. 14, so enter now. And if you already have the book, be sure to tell your friends! For those who are nearing the ends of their lives, though, food not only becomes less and less of a pleasure but also less and less necessary. That’s a hard concept to wrap your head around and even harder to confront when you see this happening to someone you love. A person’s lack of appetite is a powerful and unwelcome symbol of decline, and a harbinger of the loss we will soon experience. If only Mom or Dad would eat, you might think, they could get some strength back, feel better and slow the progression of illness. As a result, there is a giant misconception that the dying suffer terribly if they don’t eat or drink anything; that they will die of starvation or dehydration. Further, that people responsible for their care are cruel and inhumane if they do not feed the ill, or at least give them fluids. But when a person who is terminally ill stops eating, he or she cannot process food and fluids. Forcing the person to eat does not help that person to live longer, feel better, feel stronger, or be able to do more. When a man I’d been visiting for a several weeks in a nursing home recently reached that point, his sister poignantly asked me, “Can’t we get them [the nursing home] to give him a feeding tube?” Of course she didn’t want to see her brother steadily becoming weaker and weaker. Of course she didn’t want to lose him. She believed that he would get some strength back if only he would eat more. But it wasn’t lack of nutrition that was causing his decline; it was the cancer. It’s better, the experts say, to offer a little food or something to drink, and if your loved one wants it, even a minimal amount, fine. If not, don’t force it. There are other ways to continue to nourish your loved one, if food and fluids are no longer an option. A light, soothing massage. Playing favorite music. Or just sitting quietly, holding hands, offering your presence and your love. It’s important to address the issue of nutrition in your advance care directive. It may not be enough just to say “yes” or “no” to artificial nutrition and hydration, though. Recently I came across a useful document about this, published by End of Life Washington. It addresses the issue of feeding-by-hand, which could be an issue in long-term care facilities caring for people with advanced illness and/or dementia. (And it certainly underscores the importance of documenting the advance care goals and preferences of people with dementia early in their diagnosis.) You can read the full document here. I appear to be indifferent to being fed. I no longer appear to desire to eat or drink. I turn my head away or try to avoid being fed or given fluids in any other way. I spit out food or fluids. I begin a pattern of coughing, gagging or choking on or aspirating (inhaling) food or fluids. This document does not replace your advance care directive, but it is a supplement to it. This organization also has a detailed general advance care directive as well as an advance care directive for those with Alzheimer’s or other forms of dementia available on its website. They’re worth a look. In the meantime, I wish you a bountiful and joyful holiday season, filled with precious times with everyone you love. * Educate yourself about the different key treatments for end-of-life care, so that you can make informed decisions. * Start conversations with loved ones so that they are clear about your wishes for care. * Understand the benefits of palliative care and hospice care and know when to ask for them. * Learn how to communicate effectively with doctors and medical staff. * Research nursing and assisted living facilities in your community, in case you need them. * Advocate for better end-of-life care for everyone. You’re In a Nursing Home. Now What? I’m a big believer in the benefits of person-centered culture change in long-term care settings like nursing homes, where the aim is to focus more on the feeling of “home” than on “nursing.” According to the Eden Alternative , a nonprofit organization that promotes, supports and teaches about person-centered culture change, currently there are 190 skilled nursing facilities on its registry, 45 percent owned and operated by for-profit companies and 55 percent by nonprofit, county and government sponsors. But these homes still represent a small fraction of the total number of skilled nursing facilities in the U.S. What if you, or someone you love, must make the transition to a nursing home now? Fortunately, many excellent resources are available to guide you in making your choice. Deeply buried in Medicare’s Nursing Home Compare website, for example, is an excellent 56-page booklet called “Your Guide to Choosing a Nursing Home or Other Long-Term Care.” Fewer resources are available to guide you about how to live well once you’re there, however. That’s where Eleanor Feldman Barbera, PhD, comes in. A seasoned nursing home psychologist, “Dr. El,” as she calls herself on her website and blog, says that her goal is “to make long-term care a place I’d want to live when it’s my turn.” She is called in to work with residents if they are causing trouble – e.g., arguing with staff members or other residents, or refusing to take medications, or participating in rehab, or are depressed. Her approach is one of empathy, pragmatism and humor. Sometimes it’s a matter of residents adjusting to the reality of not being able to do everything for themselves, she pointed out. Generally, she advises having patience and reasonable expectations. “Come in with an open mind,” she said. “Try to partner with the team as much as possible.” While in person-centered homes your schedule revolves around you, your preferences and interests, that is not the case in conventional facilities, where schedules are set by the institution. So here’s one hint: be cognizant of the home’s schedule and when you need assistance, try to seek it before shift change times, when aides and nursing staff are particularly busy. One thing that might spur change is the sheer size of the aging baby boomer generation. In Dr. Barbera’s view, boomers are thinking differently about their own late life prospects. Generally, she said, they demand more service, have higher expectations, are more litigious and feel freer to speak out when they perceive something happening that isn’t right. Perhaps they will want co-habitation with other elders, or inviting college students to live with them, she said. Or, perhaps knowing about the existence of person-centered care alternatives, they will begin to insist that conventional nursing home operators begin to embrace its principles. And if you want to get a better sense of how a nursing home works when it embraces person-centered culture change, do take the time to watch this 22-minute video, Perham: Welcome Home. Located in Minnesota, the home includes six “households” of 16 residents each. How often have you shuddered at the prospect of being terribly frail, living in a nursing home, and then said to your spouse, your kids, your partner, your close friends, “If I ever get like that, just shoot me?” I’ll admit to having said that, myself, on a few occasions. The fact is, at some point, most of us are going to need some kind of assistance at some point in late life. Boomers may not have the luxury that our parents did, of being tended by adult children or other family members. Families may live too far from one another to enable that day-to-day caregiving. Many boomers – including a sizable LGBT population – do not have children to depend on at all. And whether in future years there will be a sufficient number of skilled home health aides to assist us in our own homes remains an open question. 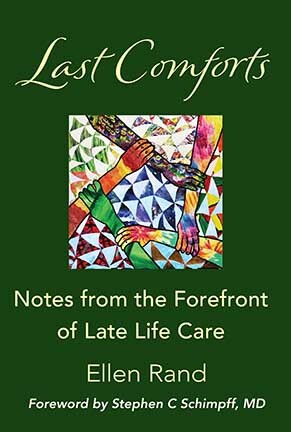 The good news is that in the course of researching my book, “Last Comforts: Notes From the Forefront of Late-Life Care,” I learned that there are viable alternatives to conventional nursing homes and that they focus more on “home” than on “nursing” in design, operation and management. Sometimes they’re called “households” or “small houses.” The Green House is one of the better-known variations on the theme of alternative nursing facilities. (www.thegreenhouseproject.org) Instead of a nursing station dominating a floor, a kitchen and common dining and living areas cater to residents who have their own bedrooms and bathrooms. A floor – often called a “neighborhood” — might include 10 to 20 bedrooms. These homes are distinguished for their person-centered care. So, residents’ own preferences dictate their schedules – that is, they can awaken when they want, eat when they want, spend time how they want to. Aides may be referred to as “universal workers,” and are given more responsibilities (and training) than aides in conventional nursing homes. The nearly 95,000-square-foot Leonard Florence Center for Living in Chelsea, Massachusetts, which has been open since 2010, is a case in point. (www.chelseajewish.org) It cares for 100 residents in 10 “houses” (its term for “neighborhood”) of 10 people apiece. Three of the houses serve people who need short-term rehabilitation. One of the houses serves people living with ALS; another serves people with multiple sclerosis (MS). The building’s first floor is its “Main Street,” with a bakery, deli, spa and chapel; each house also has its own communal area for games, social gatherings and other events. Each house also offers made-to-order Kosher meals; menus are designed jointly with residents and staff. There are roughly 15,500 nursing homes in the U.S. that serve about 1.4 million residents at any given time; “household” style nursing homes that embrace culture change currently represent a very small fraction of the total number of long-term care residences in this country. So the question that arises is: Can these models grow substantially over the next 20 years so that we will come to expect this level of care as the norm? The nonprofit sector has led the way in this arena. It’s time for the private sector, which accounts for two-thirds of the nursing facilities in the country, to pay attention. A: Battle Fatigue. Q: What Kind of Words Shouldn’t We Use About Illness? Yea or Nay on Medical Aid in Dying?